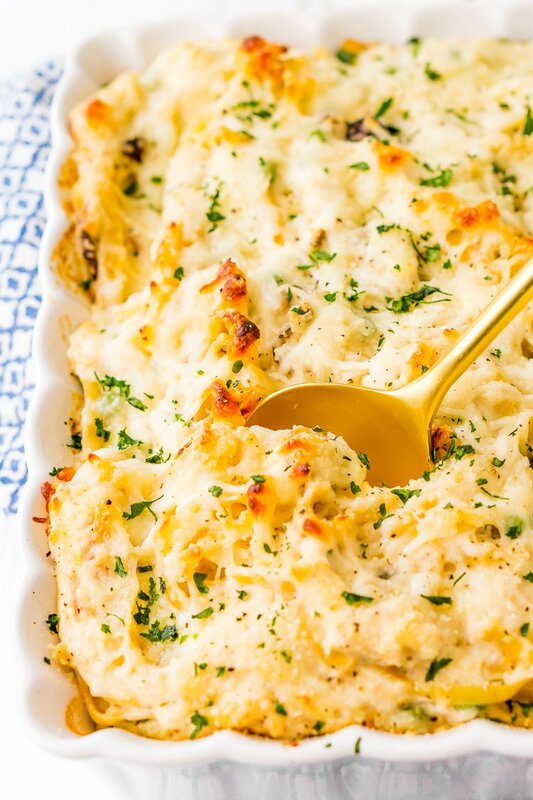 This Chicken Tetrazzini recipe is an easy, cozy, and delicious casserole dish! Fettuccine, chicken, mushrooms, and peas are baked into a creamy cheese sauce with tons of flavor! It’s an instant family favorite! 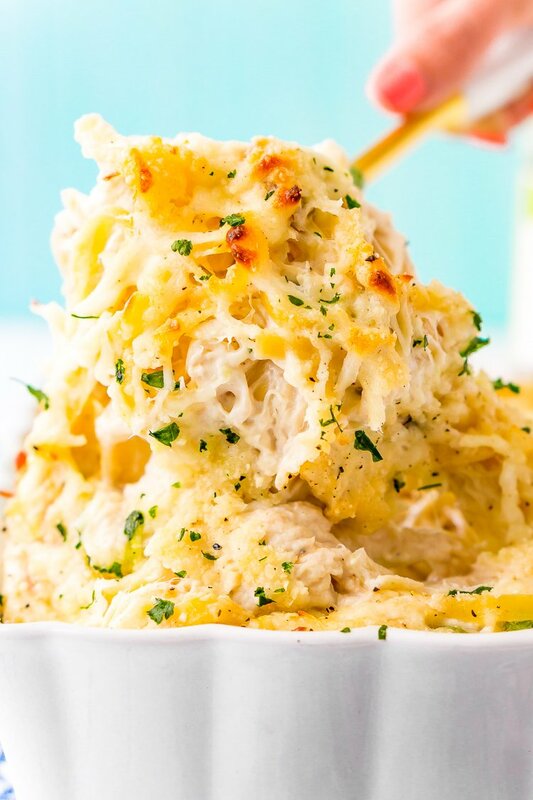 If the thought of planning quick and delicious family dinners during “back to school” season makes you shudder, don’t stress: this Chicken Tetrazzini recipe checks all the boxes! 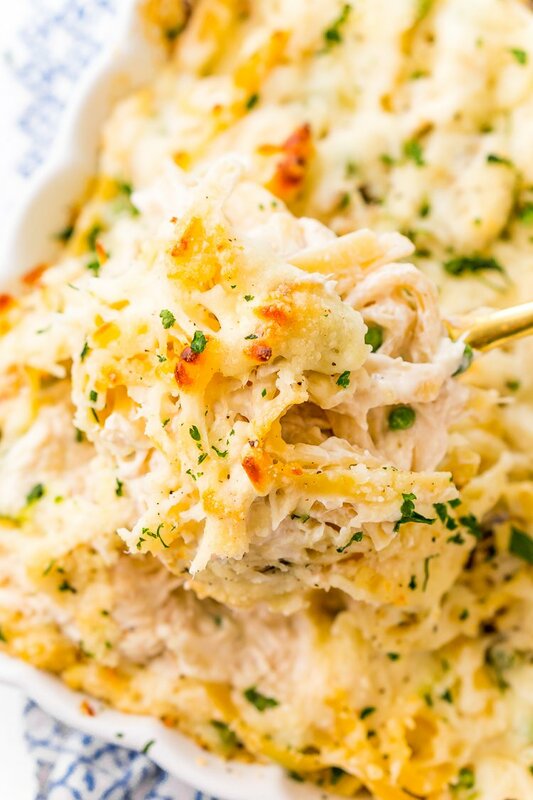 Creamy, hearty, and cozy for chilly nights, Chicken Tetrazzini combines classic ingredients to make a meal that’s nothing short of comfort food. Best of all, it’s easy to throw together and only takes about an hour to make, with half of that being baking time. JUST TAKE ME TO THE CHICKEN TETRAZZINI RECIPE ALREADY! 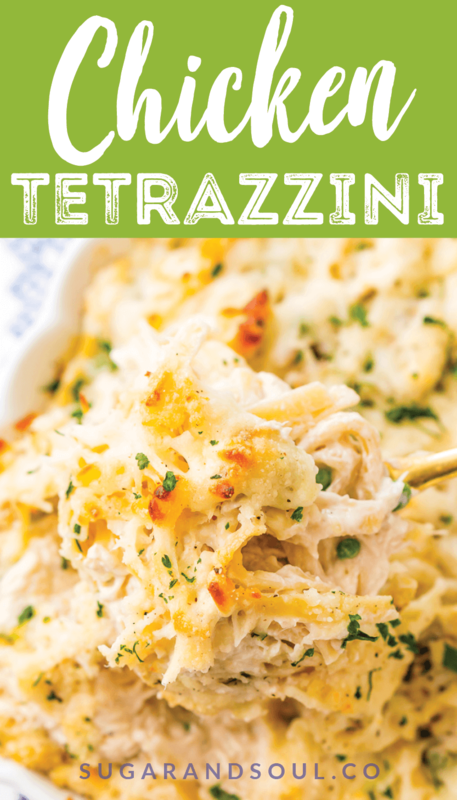 If you’d rather skip my (very helpful, I think) tips and tricks, essential cooking info, and similar recipe ideas – and get straight to this deliciously easy Best Ever CHICKEN TETRAZZINI Recipe – simply scroll to the bottom of the page where you can find the printable recipe card. It is an American dish made with diced poultry or seafood and mushroom in a butter/cream and Parmesan sauce flavored with wine with a fettuccine, spaghetti, or some similarly thin pasta. Everything is tossed together and then baked. How Do You Make Tetrazzini? Chicken Tetrazzini casserole is loaded with fettuccine, chicken, peas, and mushrooms. But the best part is the rich cream sauce, which blends cream of chicken soup, sour cream, white wine, and mozzarella and parmesan cheeses. This scrumptious meal can be thrown together in just a few steps. Simply boil the pasta until it’s al dente, pan sear the chicken, then add the sauce ingredients to make the wholesome casserole filling. A few notes on the chicken: I like to slice the breasts into thin cutlets so that they cook faster. You can either shred your chicken in a mixing bowl with the paddle attachment or chop it into pieces with a knife. The result? A bubbling pan full of twirl-able noodles, juicy chicken, tender peas and mushrooms, and that irresistible cream sauce topped with melty mozzarella cheese! Oh, and you’ll have a happy family, too (especially if they love pasta). This is one of my husband’s favorite comfort foods! If you’re really feeling ambitious, you can serve Chicken Tetrazzini with a side salad and a piece of crusty bread to sop up all that yummy sauce. 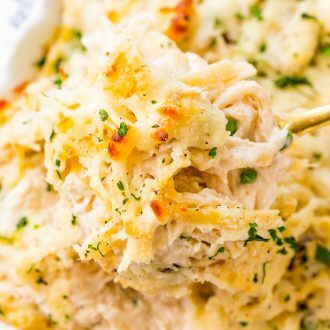 Keep this Chicken Tetrazzini recipe handy for those hectic evenings when you come home late from work or your kids have after-school practices. With a few simple ingredients and a little bit of prep, you can have a cozy home cooked dinner on the table any night of the week! You can also do all the prep work ahead of time so all you have to do is pop it in the oven when you get home, it reheats well too! 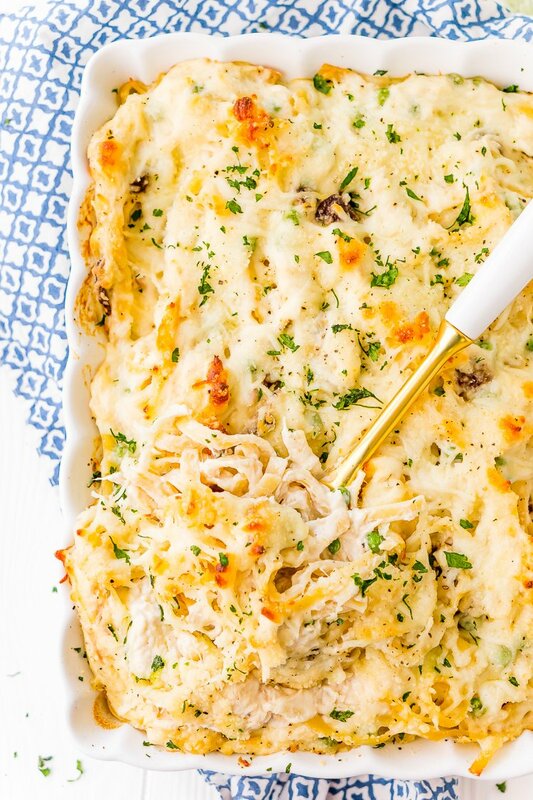 Pin this Chicken Tetrazzini Recipe for Later! 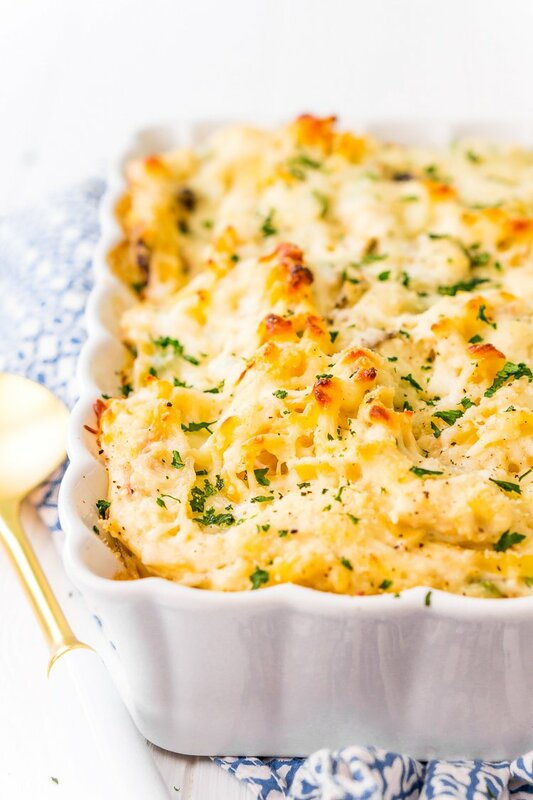 This Chicken Tetrazzini recipe is an easy, cozy, and delicious casserole dish! Fettuccine, chicken, mushrooms, and peas are baked into a creamy cheese sauce with tons of flavor! It's an instant family favorite! Preheat the oven to 350 degrees F and grease a 9x13-inch pan with nonstick cooking spray and set aside. Cook pasta according to al dente according to box directions. Once the pasta has finished cooking, drain and run cold water over it to stop the cooking process. While pasta is cooking, pan sear the chicken breast until the internal chicken temperature reaches 165 degrees F. I recommend slicing the chicken breasts into thinner cutlets so they cook faster. Once the chicken is done cooking, add it to a stand mixer fitted with a paddle attachment to shred or chop with a sharp knife. I personally prefer shredded chicken in this recipe. Keep the chicken in the stand mixer bowl or transfer to a large bowl and mix in the cream of chicken soup, sour cream, 1 cup of mozzarella cheese, salt, pepper, white wine, peas, and mushrooms and mix until fully combined. Add the pasta to the chicken mixture and mix until combined. Transfer to the mixture to the prepared baking dish and sprinkle the top with the remaining mozzarella cheese and Parmesan cheese. Bake for 30 to 35 minutes until edges are bubbly and center is heated through. Remove from the oven and enjoy hot for best taste. Chicken stock may be used in place of white wine. Peas and mushrooms may be omitted. Delish! My family loved this! This is one of my favorite ways to enjoy chicken. Such a great recipe! I love chicken or turkey tetrazzini! Yours sounds phenomenal! I haven’t added sour cream to mine before, I’ll have to give that a try next time. And I have to agree, this meal is a tasty comfort food and great for lunches throughout the week.